This is the wrap up to my Project Quilting Making Music Challenge piece...if you are not familiar with Project Quilting, check it out at Kim's Crafty Apple blog. After getting the elements fused and sewn to the field of the quilt, I chose this outer border...This is actually the reverse side of the fabric, the front side has LOTS of gold on it and I found it way too distracting for my quilt. 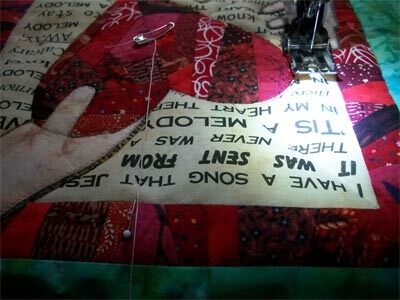 Then it was on to layering the quilt top, the batt and the backing together and start quilting! I chose to outline the heart and hands and do a radiating design from the heart to the red border. 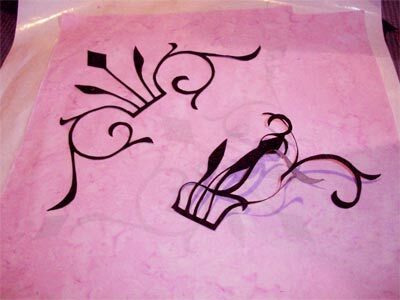 I put a freehand swirl in the outer border. 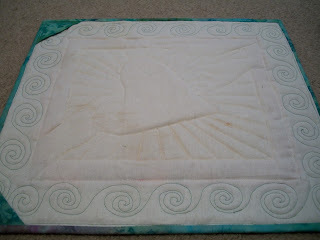 This is the back of the quilt to give you an idea of the quilting design...Yes, it has some coffee stains on it! 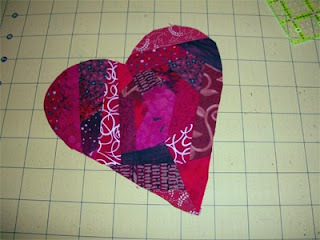 To get my lines to be straight and somewhat evenly spaced, I used a piece of thread pinned to the center of the heart. 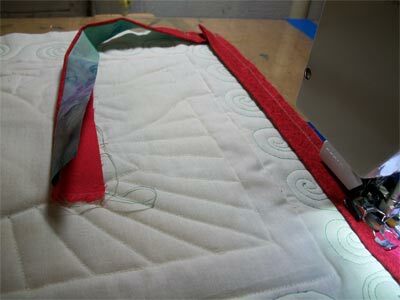 I measured specific spots on the red border and lined the thread up to give me a guideline of where to quilt. After quilting, blocking and trimming the quilt, it was time for binding. 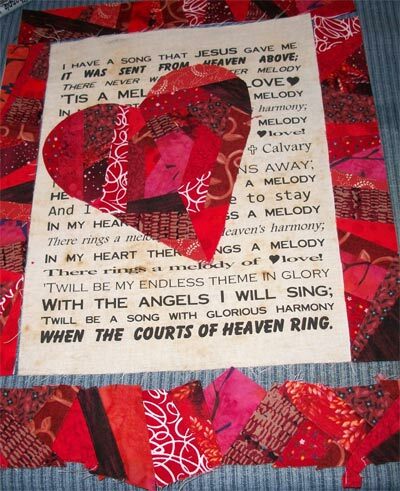 I chose to do a binding of the same color as the last border, but with a flange of red to tie it to the center of the quilt (plus the batik just looked boring when used as the binding up against the border). 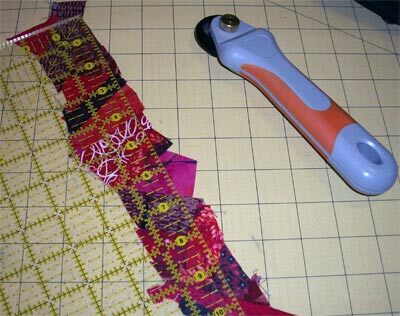 This requires cutting two narrow binding strips, the flange strip being 1/4" wider than the binding color. Sew them together and stitch them to the back of the quilt with the flange color UP (as shown above). Attach binding, flip to the front and stitch in the ditch between the binding and flange and you are done! My second challenge has been met! 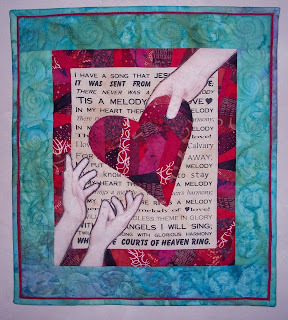 I have named the quilt "Melody of Love"
I dug out my itty bitty light table and started tracing the hands onto the fusible interfacing. So far, so good! (ignore my hands, I've been working on prepping walls and painting and they are rough and a bit swollen). 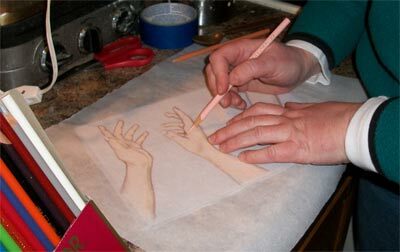 The tracing went well and the hands look wonderful! So, I colored them in, working to get the shading right (double checking the photos frequently!). They looked so good! They did NOT look good with the words of the text coming through. 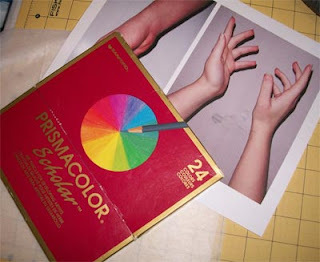 They faded to nothingness and all the hard work of hand coloring the hands was for naught. I put a piece of white fabric under them, which helped, but they needed yet another layer, a layer of shadow to make them stand out from the background. 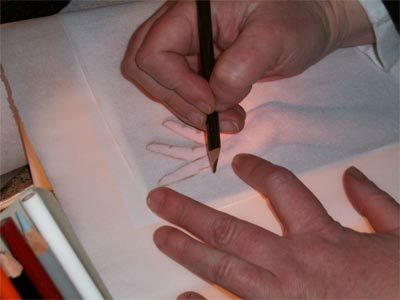 It was the right touch, but by now those hands were stiff as boards and I found out a disadvantage of the fusible interfacing...it fuzzes. The more you work with it, the more it fuzzes. I am not happy with that! 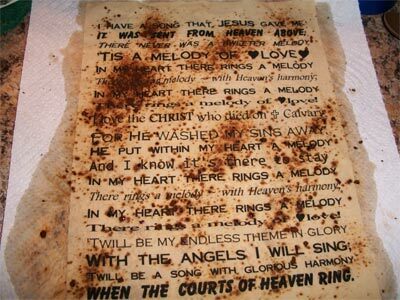 Maybe by writing it down, I'll remember to try some other method next time! One the bright side, the dark shadowed outline really was the right choice :) I'm pleased with that! I wish the hands wouldn't fade out so much in the pictures *sigh* They have more color in person! Next post I'll finish up my quilt! 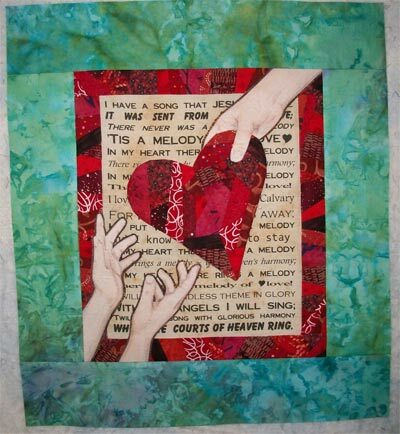 The plan is to applique the heart over the lyrics, using the method Eleanor Burns teaches, where you sew fusible interfacing to the front of the piece, turn it and stitch it down. Project Quilting Challenge Two...where am I going with this? The second challenge for Project Quilting is Making Music. 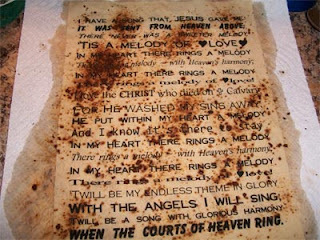 This was a happy challenge, because it meshes perfectly with our guild challenge for the year which is song/music. I've been thinking of various ideas and rejecting them as new ideas poke their heads into my imagination. Now that I am forced to choose and go forward it was almost a relief! I laid in bed Monday night rolling ideas around in my head and this one came to the fore - I guess you could say, "I came up with it in a dream" (my kids will know what I'm quoting here). 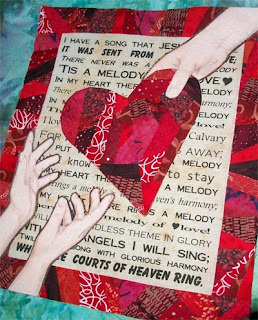 I envisioned the song In My Heart There Rings a Melody done in Subway Art style, with elements that focus on the first line "I have a song that Jesus gave me, it was sent from Heaven above" and another line in the second stanza "He put within my heart a melody, and I know its there to stay." So, first challenge is to work out the Subway Art element. I worked it up in Word, ironed my fabric to some freezer paper and sent it through the handy-dandy Epson printer...and it printed without a top margin :( I worked the file, prepped another piece of fabric with freezer paper and printed it off *whew! * it worked! I am the Vice Chair of our Quilt Guild...meaning I'm in charge of the Vice, right? In our guild, that means I am in charge of the fun meetings and only occasionally have to deal with business. All techniques are within the ability range of all guild members. *remember that in scrappy quilts the more fabrics you use, the better! pencil, zip bags to sort and contain units, rotary cutter with fresh blade, rotary cutting ruler, iron, starch, quarter inch foot, scissors, seam ripper (unless you don't make mistakes) ...and some chocolate. 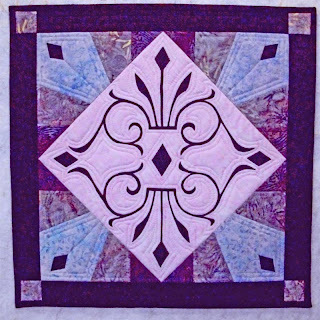 My design wall has nothing new that I can show you...I am working on a mystery quilt for my quilt guild (I will post instructions here after I share them with my guild members). 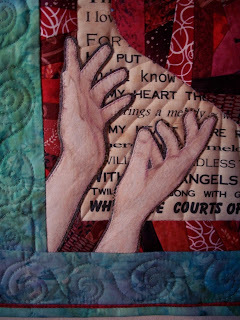 See some great design wall inspiration over at Patchwork Times. 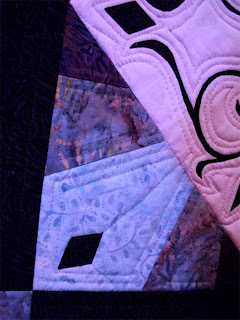 And, to add to my craziness with our moving in a few months, I decided to take part in Project Quilting, Season 3! What am I thinking???? 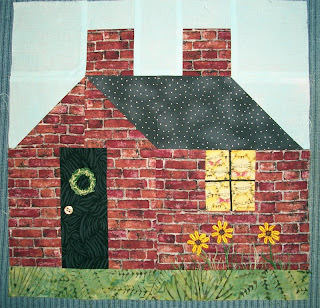 The first challenge for PQ was Architectural Elements, so I had to think what would inspire me to make a quilt? 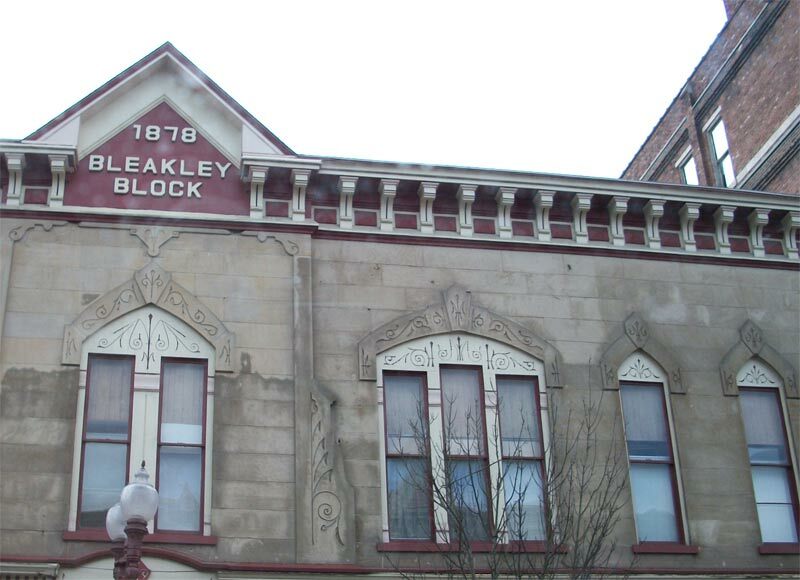 Our town has tons of Victorian homes and some very interesting buildings downtown, so I drove around and came across this building and was inspired by the art deco details. First I drew the design on Freezer Paper and colored it in. I ironed the freezer paper to my chosen background fabric. Then I transferred the design to paper back fusible web and ironed that to my chosen fabric. I have to say that cutting those tiny lines was nerve-wracking! I was so afraid that I would cut one of the other ones as I was trimming! After that, the skinny little pieces were ironed on to the background fabric, using the lines from the freezer paper as my guide. I paper pieced the pediment inspired corners and assembled the block. This is what was on my design wall on Saturday, btw! 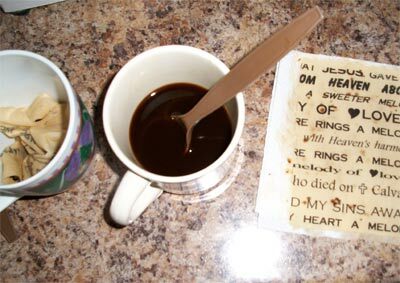 If I were to do this again, I would not iron on the pieces until AFTER the block was pieced. Even though I did everything possible to get those points to point at the corner, two were off when the corners were sewn on and I had to reposition them (not fun!!!!). 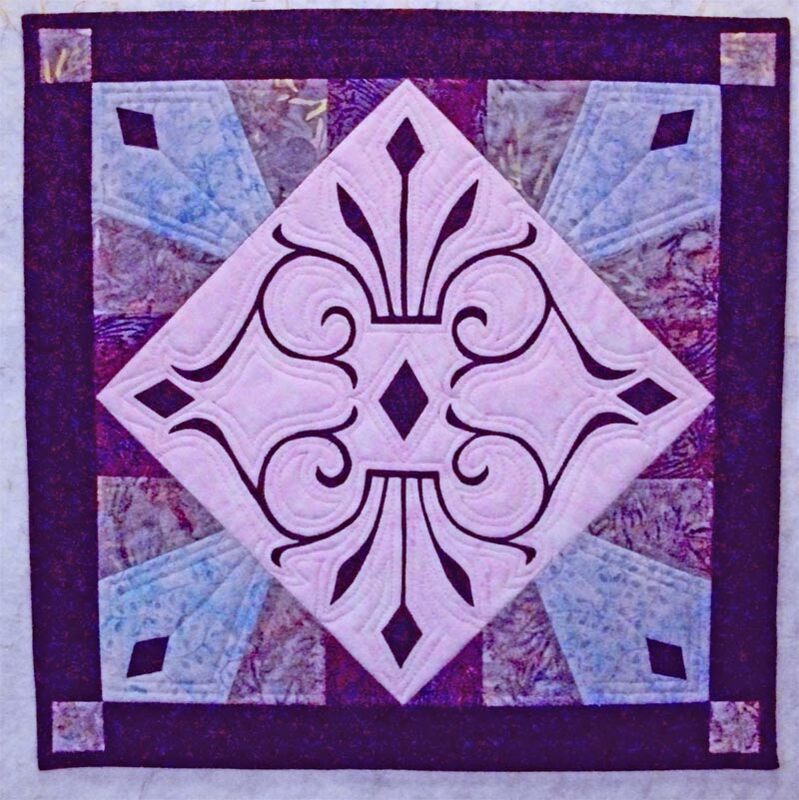 I chose to put diamonds in the corners of the block and put a narrow border around the block to set it off. Choosing how to quilt it was also a hard thing for me. I prefer free motion all over designs and this quilt would not accept such a thing! It called for echo quilting. I used my walking foot for the straight lines but had to eyeball it for the center...and my eyeballs must be a bit wonky! I am pleased with how it turned out (though the color is NOT right in this pic). And now that I am not so close to it, the quilting isn't as wonky as I feared (just don't look from 8 inches away!). Hope your quilting week is a good one! Monday? Hey, I have something to show! While I cannot show what is on my design wall (I have a secret that will be revealed later) here is what is on my design ironing board! 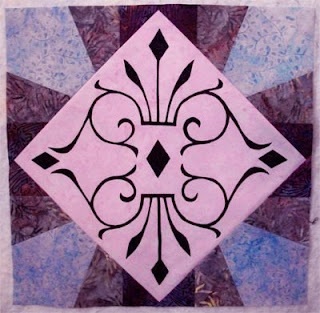 This is a block I made for a quilt someone else is making. The quilt is for The Ginger Ford Northshore (Louisiana) affiliate of The Fuller Center for Housing and they will be celebrating their 20th anniversary. Since housing is their focus...a house quilt is an appropriate raffle item! For some delightful eye candy check out other design walls from Patchwork Times! EDIT to say: the block is found on about and many other places on the internet. I just added details, a button for a doorknob, a wreath, window sashing and some flowers. I have been busy! 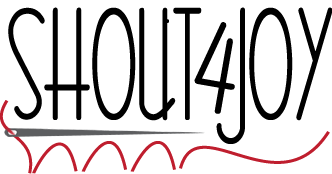 I worked on Christmas Presents most of December and couldn't show them because some of the recipients read my blog (still need to post pics, eh?). Most of all, The Army Guy got PCS orders...so we will be moving in the spring. Hope your Christmas was a blessed one!